The smith should never turn the iron on the helper's blow, he should turn on his own blow, that is, never turn the iron so that the helper's blow will hit it first because he is not prepared for it and cannot strike with confidence, but the smith will not be bothered by turning the iron for himself as he knows when he turns and is prepared for it. The smith should strike the first blow in starting, or signal the helper where to strike, in case the smith cannot strike the first blow. The smith calls the helper by three blows on the anvil with his hammer, and when the smith wants the helper to cease striking he taps with the hammer twice on the anvil. The helper should strike the blow he has started when the smith signals him to stop. The helper should watch the time of the smith's "hammer; if fast, keep time with it, if " slow, keep time with it. 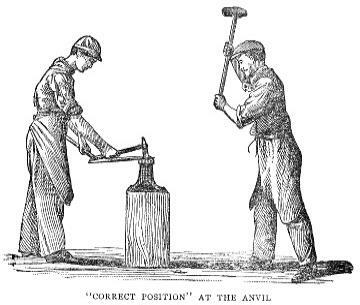 The helper should strike where the smith strikes or over the center of the anvil. The helper should always lift the sledge high, in order to give the smith a chance to get in with the hammer. It is proper before we go any farther to say a few words about the fire. An old foreman in the blacksmith department of a factory told me once in a conversation we had about the fire that he had come to the conclusion that very few blacksmiths have learned how to make a good fire. It takes years of study and practice before the eye is able to discern a good fire from a bad one. A good fire must be a clear fire, the flame must be concentrated and of a white color. Even the nose must serve to decide a bad fire from a good one. A strong sulphur smell indicates a poor fire for welding. In order to get a good fire there must be, first, good coal; second, plenty of it. It is no use to pile a lot of coal on an old fire, full of cinders and slag. The fire-pot must be clean. Many blacksmiths are too saving about the coal. They take a shovel of coal, drop it on the forge in the vicinity of the fire and sprinkle a handful of it in the fire once in a while. In such a case it is impossible to do good work and turn it out quick. Have a scoop shovel and put on one or two shovels at a time, the coal should be wet. Then pack it in the fire as hard together as you can. Sprinkle the fire with water when it begins to spread. In this way you get a hard fire. The flames are concentrated and give great heat. Saving coal is just like saving feed to a horse, or grub to your apprentice. Neither will give you a good day's work unless he has all he wants to eat. The fire, of course, should be in proportion to the work, but in every case should the fire be large enough to raise it up from the tuyer iron as much as possible. In a small fire the blast strikes directly on the iron and it begins to scale off; in a good fire these scales melt and make it sticky, while in a low and poor fire the scales blacken and fall off. This never happens if the fire is full of good coal and high up from the tuyer iron.